WASHINGTON — Being intentional about recruiting and serving Latino students, cultivating a familial community on campus and using data to implement and tailor student support initiatives were some of the strategies discussed during Excelencia in Education’s Accelerating Latino Student Success (ALASS) Institute on Friday. Sarita E. Brown, president of Excelencia in Education. The Institute followed the organization’s national announcement of it’s Seal of Excelencia initiative and its Celebración de Excelenica gathering on Thursday, which recognized four institutional and community-based programs that are excelling in advancing Latino students’ success due to evidence-based practices, committed leaders and utilization of comprehensive data systems. Those attending the institute had the opportunity to learn how to grow or enhance their own Latino student support programs by assessing strategies enacted by Cerritos Complete at Cerritos College; the Gaining Access ’N Academic Success (GANAS) program at California State University, East Bay; the Educational and Research Internship Program at the University of Puerto Rico, Mayagüez – U.S. Army Corps of Engineers, Engineer Research and Development Center; and the College Crusade of Rhode Island — this year’s Examples of Excelencia. Presenters acknowledged that much of their programs’ successes stem from a variety of high-impact practices, including meeting students where they are, creating a safe space of community, providing culturally responsive orientation and summer programs, building confidence in students and synchronizing wraparound support services across departments, among other supports specific to the context of the institution. The College Crusade of Rhode Island works with students starting in middle school and has embedded 29 full-time advisors on middle school, high school and college campuses. Advisors provide a “road map” to college for students, said CEO and president Andrew Bramson. The program also promotes social connectedness and has a family engagement component. 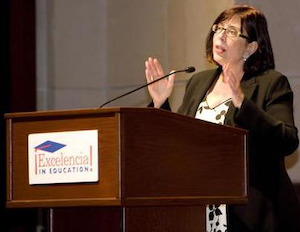 Excelencia in Education CEO Dr. Deborah Santiago noted that as a result of the efforts of the Examples of Excelencia, there was evidence of closing achievement gaps, higher retention rates of Latino students, increased graduate education pursuit, and for the Educational and Research Internship Program at the University of Puerto Rico, Mayagüez, an increase from 0.5 to 5 percent of Latino participation in the program. Many of the institutions presenting their strategies use data systems compromising of disaggregated student data, longitudinal data and also qualitative student data to guide their student success practices. Panelists sharing “lessons learned” from the Accelerating Latino College Completion Project — a project consisting of a cohort of nine institutions enrolling 7 percent of all Latino students — said that leaders at Hispanic-serving institutions (HSIs) need to take an asset-based approach to their work and understand the lens and experiences of their students coming in. Latino students’ cultural identity, multilingual status or any experiences they have working or taking care of their family can be valuable assets, said Dr. Gary Edens, vice president for student affairs at the University of Texas at El Paso. “If you believe talent is everywhere, then there’s no reason” for the discrepancy in intentional service and support of Latino students, he said. Joyce C. Romano, vice president for student affairs at Valencia Community College, said sustaining institutional efforts for Latino student success through changing leadership, changing priorities and changing momentum will require “authentic” collaboration between all partners, which includes students. “People support what they help create,” she said. Engaging full-time and adjunct faculty as part of this effort is critical as they are the group on campus that meets with students on a daily basis, said Dr. Isis Artze-Vega, assistant vice president for teaching and learning at Florida International University. Giving faculty an understanding of student data, financial resources, if possible, and the empowerment they need to accelerate Latino student success can help further institutional efforts, panelists said. In addition, showing appreciation and respect to faculty for their time and work makes a difference, panelists said. Other sessions at the ALASS Institute honed in on the ongoing legacy of Latinos as education advocates, and the connections between Latino student success and the workforce.